I had this idea that I could rope a deer, put it in a stall, feed it up on corn for a couple of weeks, then kill it and eat it. The first step in this adventure was getting a deer. I figured that, since they congregate at my cattle feeder and do not seem to have much fear of me when we are there (a bold one will sometimes come right up and sniff at the bags of feed while I am in the back of the truck not 4 feet away), it should not be difficult to rope one, get up to it and toss a bag over its head (to calm it down) then hog tie it and transport it home. I filled the cattle feeder then hid down at the end with my rope. The cattle, having seen the roping thing before, stayed well back. They were not having any of it. After about 20 minutes, my deer showed up-- 3 of them. I picked out a likely looking one, stepped out from the end of the feeder, and threw my rope. The deer just stood there and stared at me. I wrapped the rope around my waist and twisted the end so I would have a good hold. The deer still just stood and stared at me, but you could tell it was mildly concerned about the whole rope situation. I took a step towards it, it took a step away. I put a little tension on the rope, and then received an education. The first thing that I learned is that, while a deer may just stand there looking at you funny while you rope it, they are spurred to action when you start pulling on that rope. That deer EXPLODED. The second thing I learned is that pound for pound, a deer is a LOT stronger than a cow or a colt. A cow or a colt in that weight range I could fight down with a rope and with some dignity. A deer-- no Chance. That thing ran and bucked and twisted and pulled. There was no controlling it and certainly no getting close to it. 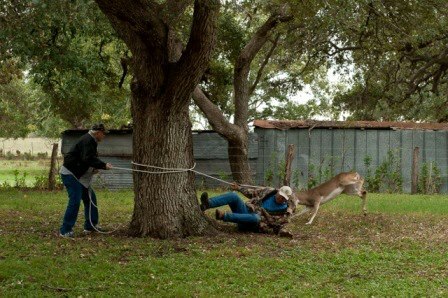 As it jerked me off my feet and started dragging me across the ground, it occurred to me that having a deer on a rope was not nearly as good an idea as I had originally imagined. The only upside is that they do not have as much stamina as many other animals. A brief 10 minutes later, it was tired and not nearly as quick to jerk me off my feet and drag me when I managed to get up. It took me a few minutes to realize this, since I was mostly blinded by the blood flowing out of the big gash in my head. At that point, I had lost my taste for corn-fed venison. I just wanted to get that devil creature off the end of that rope. I figured if I just let it go with the rope hanging around its neck, it would likely die slow and painfully somewhere. At the time, there was no love at all between me and that deer. At that moment, I hated the thing, and I would venture a guess that the feeling was mutual. Despite the gash in my head and the several large knots where I had cleverly arrested the deer's momentum by bracing my head against various large rocks as it dragged me across the ground, I could still think clearly enough to recognize that there was a small chance that I shared some tiny amount of responsibility for the situation we were in. I didn't want the deer to have to suffer a slow death, so I managed to get it lined back up in between my truck and the feeder - a little trap I had set before hand...kind of like a squeeze chute. I got it to back in there and I started moving up so I could get my rope back. Did you know that deer bite? They do! I never in a million years would have thought that a deer would bite somebody, so I was very surprised when ..... I reached up there to grab that rope and the deer grabbed hold of my wrist. Now, when a deer bites you, it is not like being bit by a horse where they just bite you and slide off to then let go. A deer bites you and shakes its head--almost like a pit bull. They bite HARD and it hurts. The proper thing to do when a deer bites you is probably to freeze and draw back slowly. I tried screaming and shaking instead. My method was ineffective. It seems like the deer was biting and shaking for several minutes, but it was likely only several seconds. I, being smarter than a deer (though you may be questioning that claim by now), tricked it. While I kept it busy tearing the tendons out of my right arm, I reached up with my left hand and pulled that rope loose. That was when I got my final lesson in deer behavior for the day. Deer will strike at you with their front feet. They rear right up on their back feet and strike right about head and shoulder level, and their hooves are surprisingly sharp... I learned a long time ago that, when an animal -like a horse --strikes at you with their hooves and you can't get away easily, the best thing to do is try to make a loud noise and make an aggressive move towards the animal. This will usually cause them to back down a bit so you can escape. This was not a horse. This was a deer, so obviously, such trickery would not work. In the course of a millisecond, I devised a different strategy. I screamed like a woman and tried to turn and run. The reason I had always been told NOT to try to turn and run from a horse that paws at you is that there is a good chance that it will hit you in the back of the head. Deer may not be so different from horses after all, besides being twice as strong and 3 times as evil, because the second I turned to run, it hit me right in the back of the head and knocked me down. Now, when a deer paws at you and knocks you down, it does not immediately leave. I suspect it does not recognize that the danger has passed. What they do instead is paw your back and jump up and down on you while you are laying there crying like a little girl and covering your head. I finally managed to crawl under the truck and the deer went away. So now I know why when people go deer hunting they bring a rifle with a scope......to sort of even the odds!! Me and my best friend Mike freed up a buck who ran into a fence and got his rack stuck in a fence. Shaking and push pulling his head the fence was twisted and almost knotted around his points. We decided to get one side out and hold it as still as possible and get the other free. It sure wasn't anywhere near as easy as it sounded. We escaped with several bites each but managed to keep our heads clear of those pointy points. when we got him clear we put our arms up to protect our faces from his rack but he did what the roped one did, reared up and tried to strike us like a kangaroo fights. We jumped into the truck and he ran into the lake and swam away. We were bruised from his hooves mostly on the arms blocking his whacks at our heads. When we split up running for the truck he just stayed there I guess not knowing which one of us to keep on beating. Never again!